USS GEORGE H.W. BUSH, Mediterranean Sea—During the early days of World War II, the United Kingdom’s Prime Minister Winston Churchill made a memorable comment about British pilots’ defense of their homeland from Nazi Germany. “Never in the field of human conflict was so much owed by so many to so few,” Churchill said in an August 1940 speech. 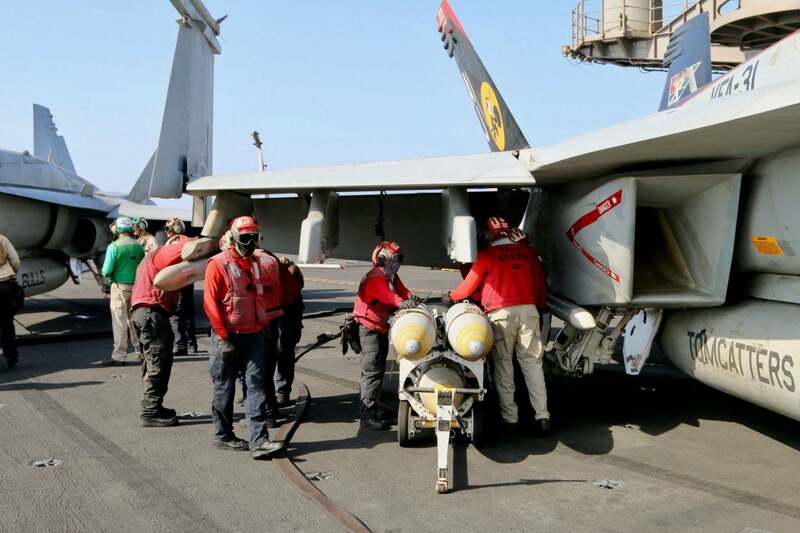 Seventy-seven years later, U.S. Navy aviators and sailors have their own singular burden to bear as they support Operation Inherent Resolve, the U.S.-led coalition against the Islamic State in Syria and Iraq. In this war, a single misstep born of a split-second decision during combat operations—both in the air and at sea—could cost hundreds of innocent lives, or perhaps even precipitate a shooting war between the U.S. and Russia. 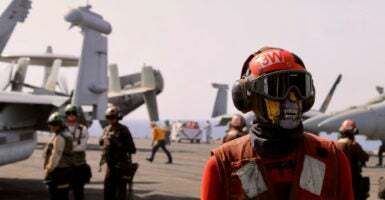 “You’re always on guard,” Lt. Brandon Rogers, call sign “Barf,” an F/A-18 Hornet strike fighter pilot aboard the USS George H.W. Bush, told The Daily Signal. The Daily Signal was aboard the USS George H.W. 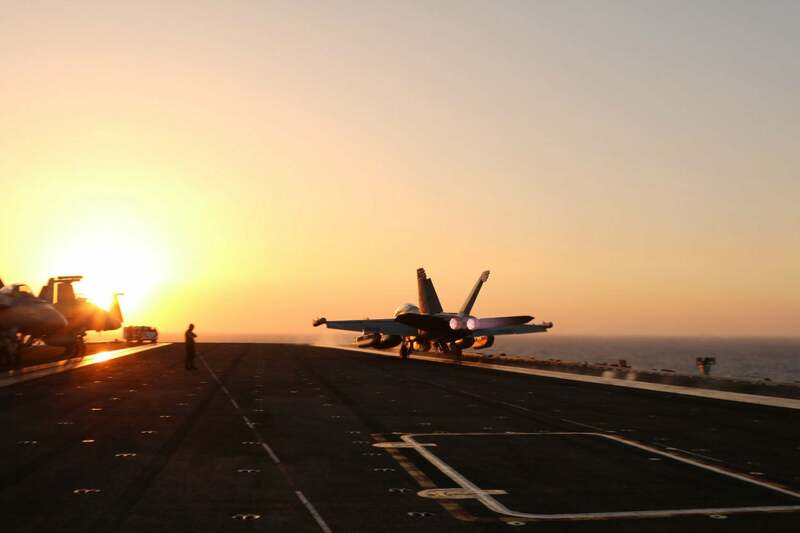 Bush aircraft carrier during combat operations in support of Operation Inherent Resolve. As the Islamic State, the terrorist army also known as ISIS, loses territory, the myriad military forces arrayed against it are converging. The battle space, consequently, is increasingly crowded, and U.S. forces and the local groups partnered with them on the ground are more frequently brushing up against the Russian and Syrian regime militaries. Meanwhile, at sea in the eastern Mediterranean, U.S. warships supporting Operation Inherent Resolve are interacting with the Russian navy in ways not seen since the Cold War. 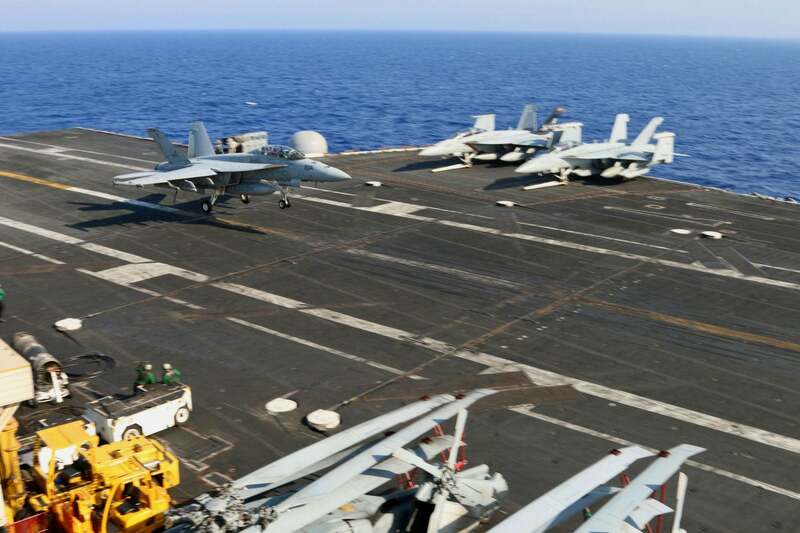 “As the area gets more and more constricted, as Russian forces and pro-regime Syrian forces as well as U.S. forces and forces that the U.S. backs start moving tighter and tighter into other areas, then that deconfliction will have to be worked out,” Rear Adm. Kenneth Whitesell, commander of Carrier Strike Group Two, told The Daily Signal in an interview. F/A-18 Super Hornets line up at the catapult, ready for launch. The air war over Syria is one of most complex that U.S. Navy aviators and sailors have ever faced. Aviators are on guard against air-to-air threats while they exercise a close air support mission honed from 16 years of post-9/11 counterinsurgency operations. While at sea, sailors dust off Cold War-era tactics to deal with increasingly bold and persistent run-ins with Russian warships. At stake every day are U.S. strategic interests, the fate of ISIS, and the lives of civilians caught in the crossfire. Also, the durability of peace between the world’s top two nuclear powers hinges on the coolheadedness and judgment of U.S. military personnel. “We spend about a year training before we deploy. And those trainings will go from diverse air-to-air scenarios to close air support,” Capt. James A. McCall, commander of Carrier Air Wing Eight, told The Daily Signal in an interview. An F/A-18 Hornet launches from the USS George H.W. Bush at sunset. The USS George H.W. 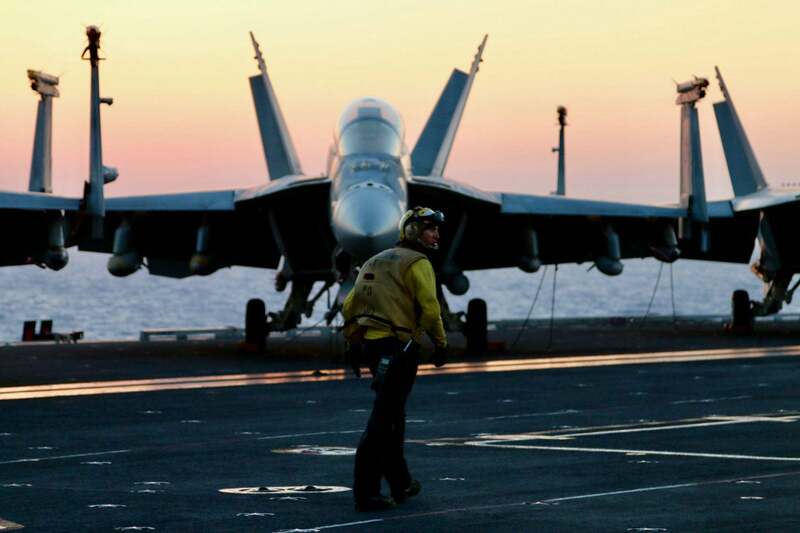 Bush aircraft carrier is on its third deployment, and the second in support of Operation Inherent Resolve. The sailors refer to the ship as “the Bush,” although their commanders discourage that nickname. The George H.W. Bush was commissioned on Jan. 10, 2009. It’s the 10th and last of the Nimitz-class carriers, which date back to 1975. The ship is 1,092 feet in length—about as long as the Empire State Building is tall. Two nuclear reactors with enough fuel for 20 years provide power. Despite its massive size (more than 200 feet longer than the Titanic), the carrier boasts a top speed in excess of 30 knots (about 35 miles per hour). The carrier is a veritable city at sea. It towers 20 stories above the waterline, displaces about 97,000 tons, and the flight deck comprises 4 and a half acres. Roughly 5,000 sailors are on board, along with 80 aircraft. 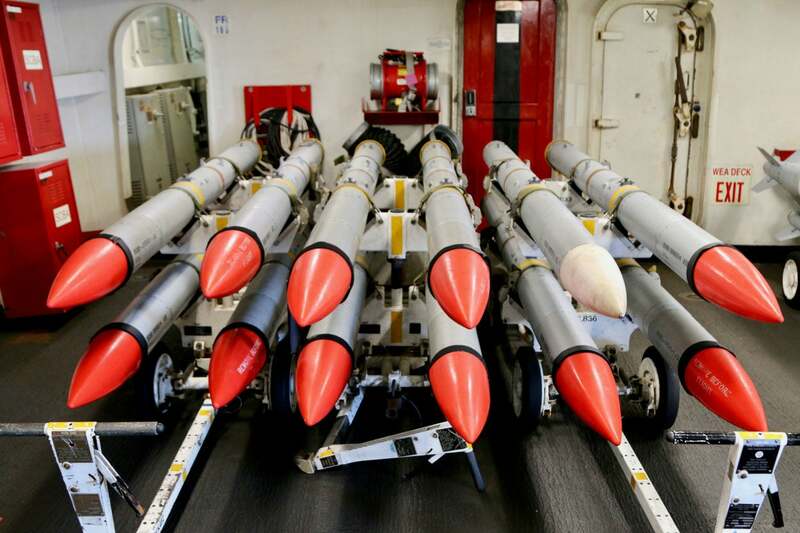 Live munitions ready to be loaded onto aircraft destined for the skies over Syria and Iraq. Most of the F/A-18 Hornet and Super Hornet strike fighters that launch from the deck of the USS George H.W. Bush are loaded with live munitions—both air-to-air missiles and precision bombs. 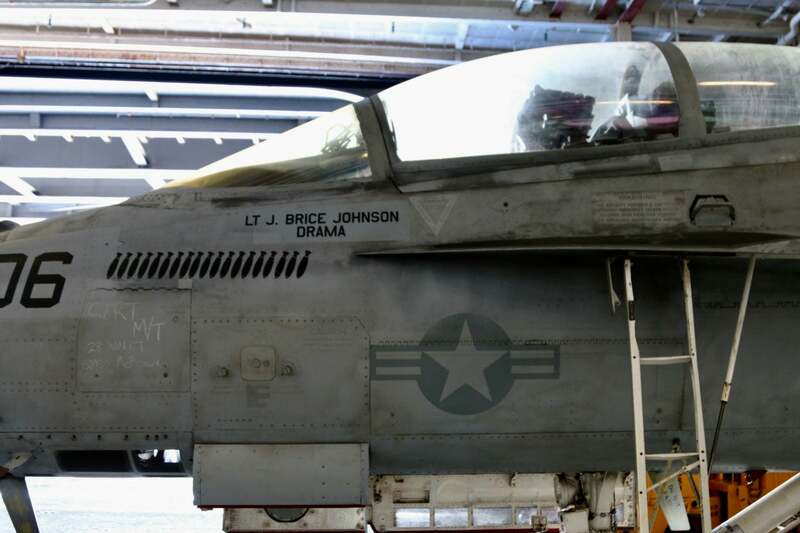 Almost all the jets are adorned with a few rows of small bomb symbols painted beneath the canopy rails, a testament to the combat history of each aircraft. 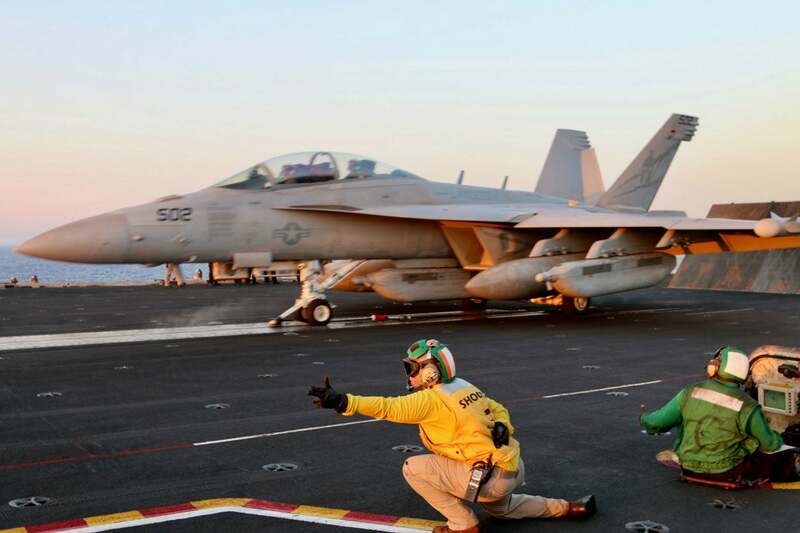 There are also EA-18G Growlers on board, which have the same airframe as the Hornet but wield an electronic warfare suite instead of kinetic weapons. To the uninitiated observer, flight deck operations are orchestrated chaos. It’s loud and confusing as the Hornets and Growlers advance one-by-one to the catapults. There, the planes stop, and the green shirts attach the catapult shuttle to the front landing gear. The blast deflectors are raised. A few checks, some hand signals. The green shirt runs away from beneath the landing gear to get clear and then gives a thumbs up. Now, the engines spool up to full power. The pilot scans the flight instruments and engine readings. All good. The afterburners crackle and roar. The aircraft settles into its landing gear struts against the shackled thrust of the engines. The pilot salutes, then braces for the squeezing G-forces of launch. More than 5,000 crew members live aboard the USS George H.W. Bush. The yellow shirted “shooter” lunges like an attacking fencer, the signal for launch. One second, maybe two later, the warplane lurches forward with the initial kick of the catapult and then accelerates straight and smooth from zero to 184 miles per hour in just two seconds before rocketing off the edge of the flight deck. The airborne jet slides straight away, maintaining the level of the deck for a beat before it climbs, the afterburners’ fire glowing behind. Then, the whole process repeats itself, again and again, until the catapults clear out and it’s time for the landings. The planes come in at a steady rhythm. Once they hit the deck, the drooping tail hook catches the arresting wire. The deceleration from an approach speed of 155 miles per hour to a full stop happens in about 320 feet. Amid the awesome spectacle of carrier flight deck operations, there are subtle clues that this is a ship at war. The bomb symbols painted on the sides of the jets, for example. Or, the fact that some of those Navy warplanes coming back to land on the George H.W. Bush are missing a bomb or two from their wing pylons. A quiet reminder that many of the ship’s daily launches and landings are not for training—they are for combat. Each day, in fact, the ship averages between 16 and 24 combat sorties. 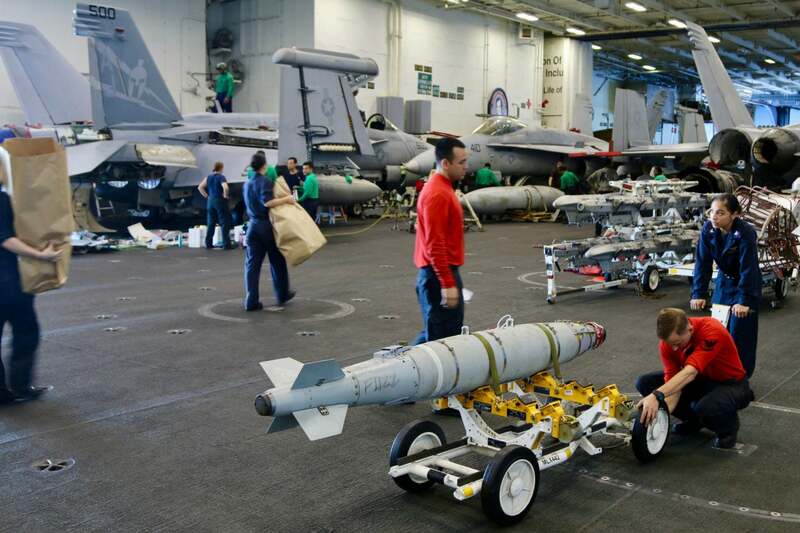 Flight deck crew members load live munitions onto the wing pylons of an F/A-18 Super Hornet. These pilots and the warplanes they wield are the leading edge of America’s ongoing air war against ISIS—and they kill the enemy every day. “We’re rooting out an enemy that needs to go away, and I think the administration’s been very clear that our job is to annihilate them, and that’s why we’re here and why we’re doing it,” McCall, the Carrier Air Wing Eight commander said. After nearly three years, U.S. military pilots such as those operating off the George H.W. Bush continue to wage a relentless air war against ISIS from over the skies of Syria and Iraq. The terrorist army is on its heels. Its stronghold of Mosul is lost. And Raqqa, its de facto capital, is under siege. ISIS has largely lost freedom of movement in the open, exposed expanses of Syria and Iraq where its fighters are easy prey for U.S. and coalition warplanes and the “unblinking eye” of intelligence, surveillance, and reconnaissance (ISR) aircraft. The USS George H.W. Bush carries about 80 aircraft. U.S. pilots say the coalition has the battlefield momentum and ISIS is in its death throes—but the war is not over. As ISIS is squeezed out of Raqqa, its leadership is moving south down the Euphrates River valley to re-establish its forces in the Deir al-Zour and the Tal Afar areas. 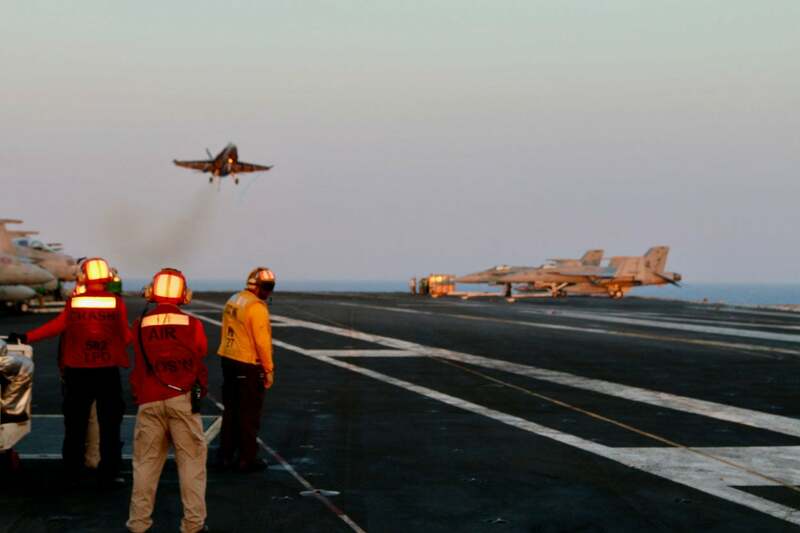 After three years under pressure from the U.S.-led air campaign, the terror group has lost more than two-thirds of the territory it held in 2014, when Operation Inherent Resolve began. And, according to U.S. officials, more than 60,000 ISIS fighters have died in combat since 2014. 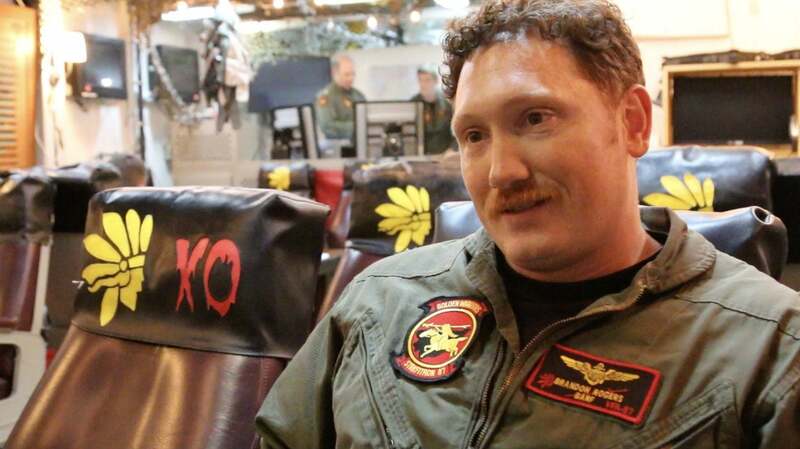 “When you start seeing people going back to their homes, when we see cities being liberated, that’s success,” a Navy F/A-18 Hornet pilot who goes by the call sign “Bacon” said. In the summer of 2015, the war against ISIS was at a macabre equilibrium. The U.S.-led coalition was killing about 300 ISIS fighters a week, roughly the same rate at which the terrorist army was able to recruit new fighters. Now, recruitment has slowed as the militants’ losses continue to mount. 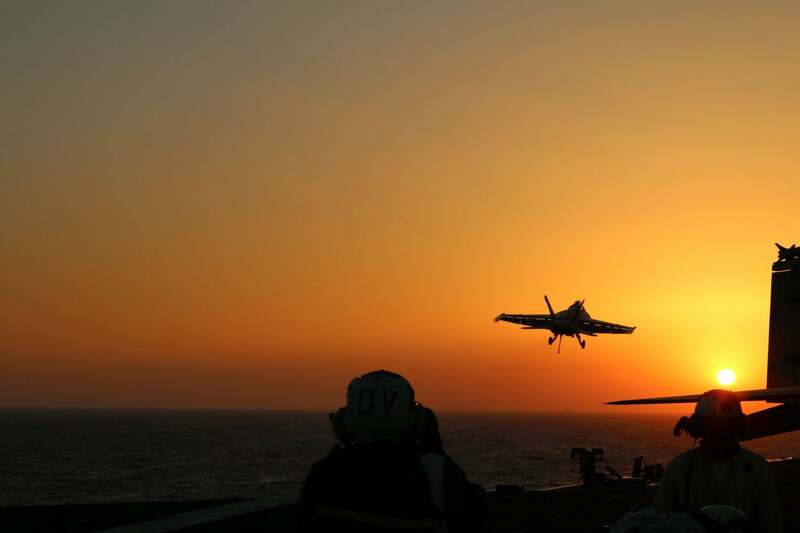 “When you start seeing people going back to their homes, when we see cities being liberated, that’s success,” a Navy F/A-18 Hornet pilot who goes by the call sign “Bacon” told The Daily Signal in an interview. The pilot, a lieutenant, agreed to be photographed, but asked that his full name not be used due to security concerns. “We’re in the driver’s seat, we’ve got them on their heels,” Bacon said. Operation Inherent Resolve uniquely fuses in a single mission the lessons learned from the Cold War with the past 16 years of post-9/11 counterinsurgency warfare. The battle space in which the U.S. military operates to fight ISIS, over the skies of Iraq and Syria and in the eastern Mediterranean Sea, is as eclectic and challenging as any in U.S. military history. There, U.S. personnel face myriad threats and fulfill multiple combat roles on every sortie. 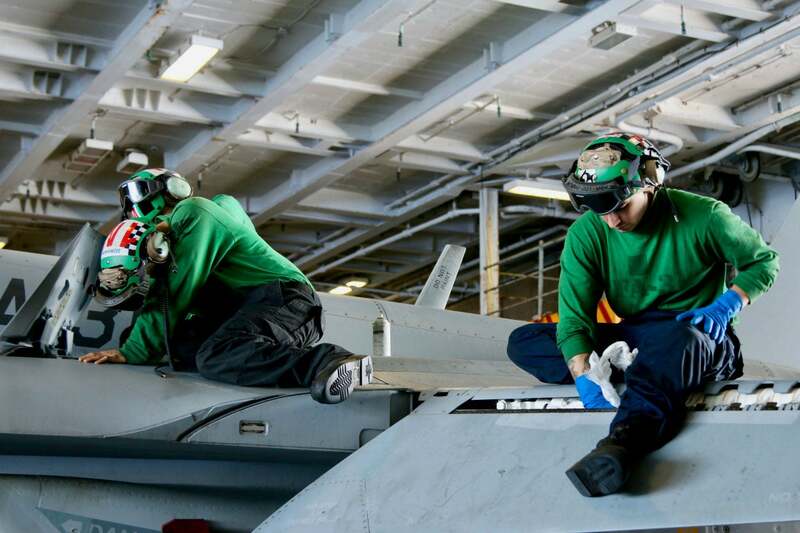 Aircraft maintainers work about 12 to 13 hours a day to keep the USS George H.W. Bush’s fleet of combat aircraft flying. On each mission, U.S. pilots face legitimate air-to-air and surface-to-air threats—threats that were virtually nonexistent to supersonic fighters during the majority of the post-9/11 wars in Iraq and Afghanistan. Once on station, the U.S. warplanes and their aircrews face the more familiar role of providing close air support and aerial surveillance to ground units. But there’s a twist—coalition partner ground forces operate with only a shadow U.S. ground presence, often removed from the front lines against ISIS. Therefore, without reliable direct communications with the ground units they’re supporting, U.S. pilots commonly rely on airborne ISR sensor feeds from manned and unmanned aircraft to search for their targets and keep an eye out for civilians. It’s a challenging task, in which the U.S. military leans on battlefield experience and technology advancements born from the post-9/11 wars in Iraq and Afghanistan. 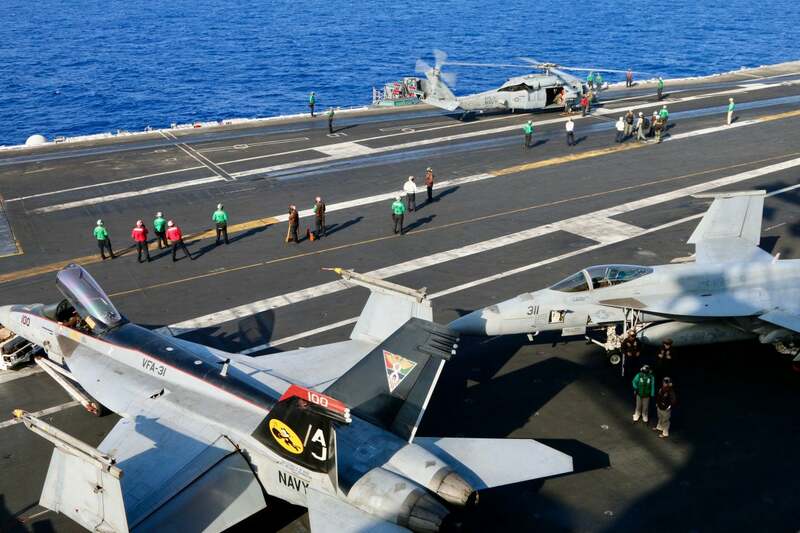 “Our situational awareness, which then leads to precision targeting, is completely different than when I was a part of Desert Storm and Desert Shield,” Whitesell, the Carrier Strike Group Two commander, said. Flight deck operations go both day and night. For 16 years, U.S. military personnel have observed the ground-level behavior of insurgent groups from the skies over Iraq and Afghanistan. 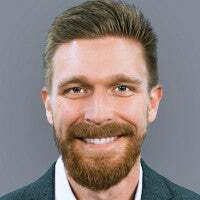 Due to that education, U.S. tactics and technology are now able to prosecute a counterinsurgency campaign almost exclusively from the air, clearing the way for foreign ground forces to advance with a minimum U.S. ground footprint. This is the USS George H.W. 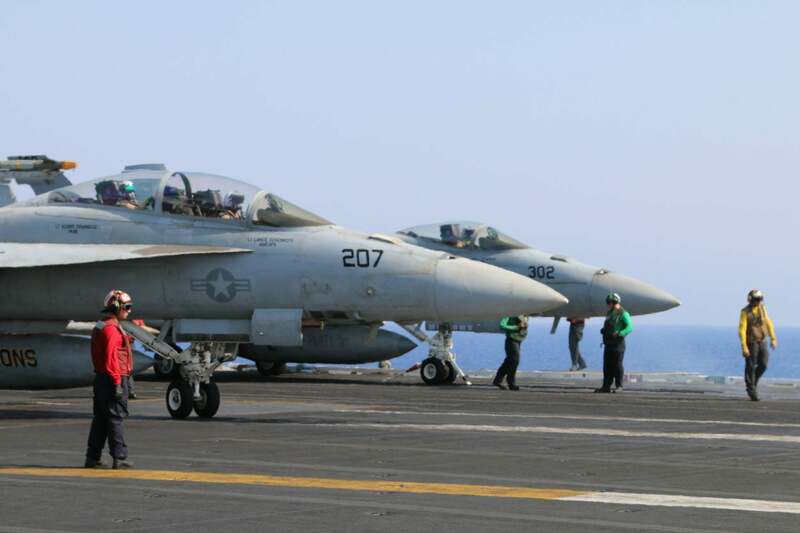 Bush’s second deployment in support of Operation Inherent Resolve. U.S. pilots decide when to drop bombs based on pattern of life observations. That’s to say, by observing, over a period of time, the behavior and movements of individuals on the ground who appear only as black and white images on a small screen in the pilot’s cramped fighter jet cockpit. Command and control staff at ground operations centers analyze those images and approve airstrikes, but it ultimately falls on the pilot or airborne weapons system operator to make the final call before releasing weapons. It’s his or her hand on the button, and if something doesn’t look or even feel right, it’s their prerogative to abort. “From the air, nobody’s wearing, ‘Hey, I’m the bad guy’ clothes,” Whitesell said. One of our pinnacle moments was when we were cleared to do a strike into one of the areas. And the pilot was able to look and see, look through his device, and what he saw was a group of people coming out of a house, and they just kept coming out of a building … and they started walking along a street. And that pattern of life did not equate to what ISIS would [do]. Even though he was cleared for that strike, he decided to abort … and then relay back to command and control organizations that it looks like we’ve got refugees in this town moving out of this building… you just don’t drive in if you’re approved for the strike. That kind of judgment and clear thinking under pressure comes from years of combat experience distilled into effective training programs. When you have seconds to decide whether a group of people walking toward friendly forces is a unit of ISIS fighters or a gaggle of refugees, there is no black and white set of criteria upon which to rely. It’s more akin to an art than a reproducible, workmanlike checklist. And the consequences for making the wrong decision are catastrophic. Many jets have a few rows of small bomb symbols painted beneath the canopy rails, a testament to the combat history of that aircraft. U.S. military operators perform their jobs according to their commanders’ stated intents and clearly prescribed rules of engagement. But no commander’s guidance or rule of engagement is ever perfectly crafted to cover every possible situation. It takes judgment and training to properly apply the spirit of those decision-making templates to the reality of the battlefield as it is. U.S. Navy aviators say they frequently encounter Russian warplanes over Syria. There is a direct phone line set up between American and Russian three-star generals in their respective operations centers to deconflict air operations, and Whitesell said it’s used several times every day. “If we see something in the air that we don’t understand we call back to the command and control organization and they get the message back to the CAOC [Combined Air Operations Center] and someone gets on the phone and talks to the Russians immediately so that we can resolve any misunderstanding that we’ve got over any of these areas,” Whitesell said. “There is open communication between the Russians and our military,” McCall said. 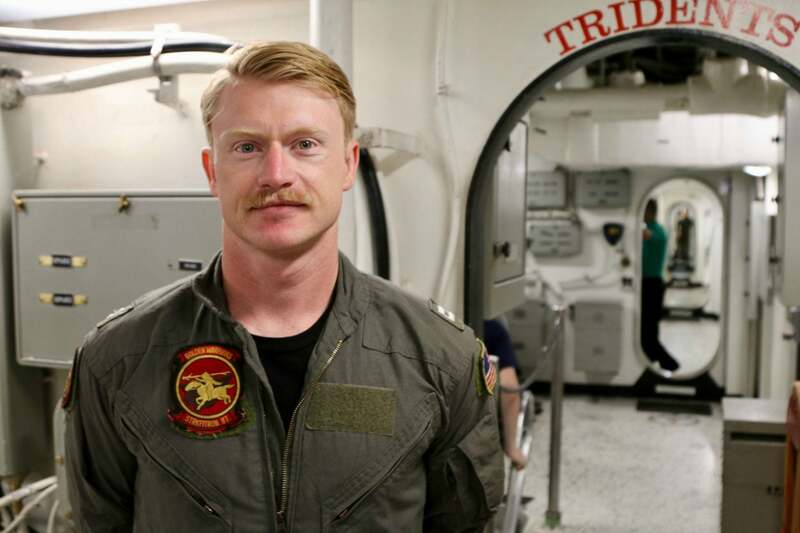 “You’re always on guard,” Lt. Brandon Rogers, call sign “Barf,” an F/A-18 Hornet pilot, said. At sea, the USS George H.W. Bush carrier strike group has frequent run-ins with a gamut of Russian naval vessels. Unlike in the air, however, there is no unique agreement moderating U.S.-Russian naval interactions in this theater. Instead, the two navies rely on a Cold War-era agreement called “Incidents at Sea.” They use their bridge-to-bridge radios over a common frequency, communicating with each other through a series of codes hashed out in 1972. “The funny thing about that is when I first came in the Navy quite some time ago that was something we trained on quite a bit because it was the end of the Cold War,” Capt. Benjamin Nicholson, commodore of Destroyer Squadron 22, told The Daily Signal, referring to the Incidents at Sea agreement. And as we went into a time post-Cold War, we really didn’t have these interactions with the Russians … Well, the publication and the agreement is still on the books, and it’s something that over the last several years has been coming back quite a bit … to communicate with the Russians to ensure that there is no misinterpretation of what the other one is doing … We talk to the Russian ships that are here and tell them what we’re doing so we can position ourselves and not have something be mistaken for something threatening. American military personnel mostly shrug off brushes with Russian naval vessels and warplanes as part of their daily routine, whereas civilian media and political leaders typically characterize the encounters as a much bigger deal. “Not to dampen the excitement, but frankly they’ve been fairly routine,” McCall said, referring to encounters with Russian warplanes over Syria. Ultimately, it’s the mutually shared overtures of professionalism between Russian and U.S. military personnel that prevent interactions at sea or in the air from escalating into a conflict. Crew members watch as a Hornet performs a go-around. U.S. military personnel look at these encounters as a valuable chance to get real-world experience interacting with Russian forces, which U.S. forces usually have to simulate in training. On landing, aircraft decelerate from an approach speed of 155 miles per hour to a full stop in about 320 feet. Personnel aboard the George H.W. Bush said the Russians have not hindered or interfered with U.S. combat operations in support of Operation Inherent Resolve on their current deployment. But the Americans clearly don’t want to give the Russians any advantages. The two sides tolerate each other, but also watch each other closely. “We’ve had a number of different Russian ships that transit through the area, but notably, we’ve had a couple of their top-line frigates that have been with us consistently for a period of time,” Nicholson told The Daily Signal. It is, in many ways, a return to a Cold War back and forth between U.S. and Russian forces, in which both sides know the limits of what their counterparts will tolerate. A shared understanding that with military forces operating in such close vicinity to each other, interactions are unavoidable—as is the temptation to snoop on how the other side does business. 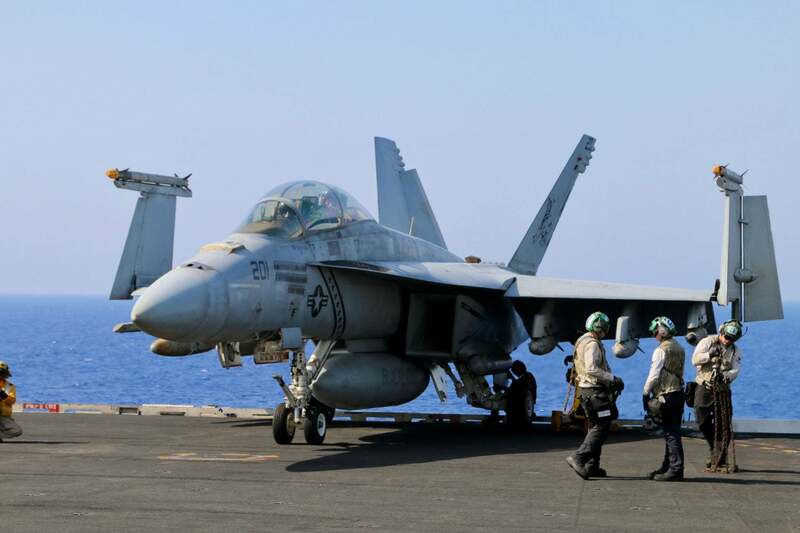 On June 18, a U.S. Navy F/A-18 Super Hornet shot down a Syrian Su-22 that was attacking Syrian Democratic Forces troops, a U.S. partner force on the ground. It was the first U.S. military air-to-air kill in 18 years. Inside the hangar bay belowdecks on the USS George H.W. Bush. On April 6, the U.S. military launched a barrage of 59 Tomahawk cruise missiles at a Syrian air base. The facility, jointly used by Russian forces, was the launch point for a chemical weapons attack on April 4 that killed about 80 people, including children, U.S. officials said. The U.S. has since vowed to strike the Syrian regime if it uses chemical weapons again. Navy commanders aboard the USS George H.W. Bush are confident the carrier strike group could rebuff any retaliatory strike by the Syrian regime. Syria has coastal defense missiles, but they can be avoided by staying outside their range, or with countermeasures, the commanders said.